Working with the Frannie Peabody Center in Portland, Maine Heath produced a second iteration of his Disclosional Design Experience. In the summer after completing his Masters Thesis: Disclosional , Heath was contacted by the Frannie Peabody Center and asked if he would design a version of Disclosional for their World AIDS Day Event on December 1st, 2015. Working with Katie Rutherford the Director of Development Heath was put in touch with six members of the community in Portland. Each person was living with HIV and represented a different group of society illustrating that HIV affects everyone. Heath approached this from a design research standpoint, and was flown up to Portland from New York in October, to research the community and to record the stories of members of the community. Keeping to the original format of Disclosional, Heath met with HIV positive individuals and recorded the recollections of the day they found out they were HIV positive. These recordings were collected in person in the style of a conversation between two people. Participants signed a release form and were assured that their names and identities would not be revealed. Heath then returned to NY to edit the stories into five to eight minute segments. During the months of October and November Heath was able to use the facilities at Marchon where he currently works and the Visible Futures Lab at School of Visual Arts , to CNC six flat pack phone booths. During this time Heath also designed all outward facing material and graphics for the experience. 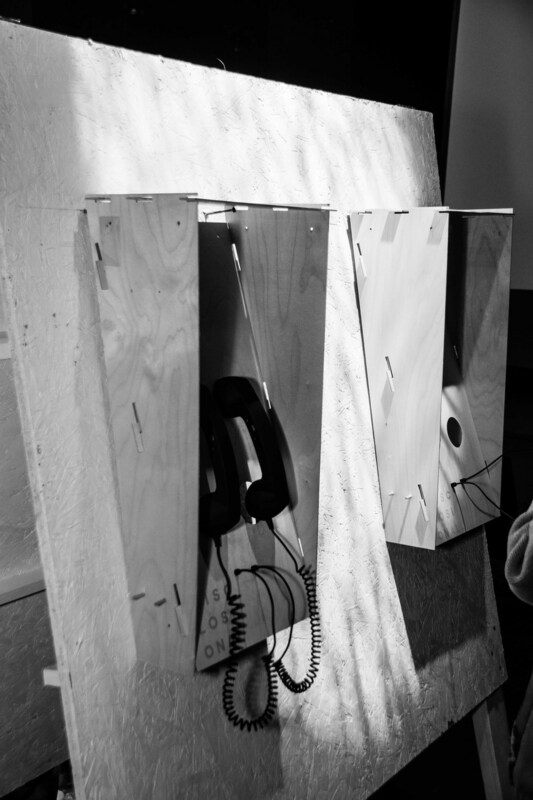 Each phone booth is constructed out of two sheets of 32" birch plywood that has been CNC cut. The phone booths are comprised of five interlocking panels that when disassembled flatpack to a height no larger than 3". This enabled Heath to ship his final product rather than transport it himself. Each phone both holds one mp3 player and two phone receivers. Heath placed the two phone receivers close to each other to create a more intimate experience. This also allowed for more listeners. The experience was held in Space Gallery for one night in the form of a pop-up. At the end of the night Heath was introduced as the keynote speaker. After talking to those in attendance about his design process and the goals of his work and then opened the conversation up to questions from the audience. Heath will return in June to produce the event again for Portland Pride.